I have the perfect husband. At least perfect he’s for me. As a teenager I created an image of my ideal man. Between romance novels (I was reading Danielle Steele and Jude Deveraux in middle school) and my parents’ feminist teaching, I had quite the list. I wanted a man who was in touch with his feelings, yet would kill to protect me. He had to be able to clean and cook, and also provide me with food and shelter in a survival situation. I wanted a spiritual artist, a badass ex-military ninja, and a loving kind husband and father, and I got that. He is perfect, and I like to imagine that I am perfect for him too, but really I doubt he dreamed of having an overweight high maintenance redhead for a wife. However I do believe the universe groomed us to be together. 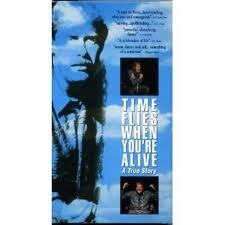 In 1989 there was program on HBO called ‘Time Flies When You’re Alive’ It was a one man tribute to his wife. This show changed my life. I was up alone at night, a common thing when I was 15, and this came on. I recognized the actor. He used to be on CHiPS and was sucked into the story of his wife. I was crying at the end, knew I would have my babies at home, and was even more drawn to alternative living. Hundreds of miles away, and I like to imagine at the exact same time, my future second husband who was 31 also watched the show. I like to think this wasn’t a coincidence but the universe sending us down a similar path even though we wouldn’t meet for four more years. Do you have a similar story? You were groomed by the universe for your partner? Working My Mad Ninja Parenting Skills	Dance for Everyone who is Watching. In Yiddish the word “bashert” (literallly “destiny”) expresses the concept that there is one ideal person/soulmate who is meant to be your partner in life. Looks like you and your spouse found yours. Mazel tov! PS: Love the new look on the blog. Oh yeah! The universe knew what it was doing when I met my DH. My home city is Glasgow in Scotland. Way back in the day, I worked for an International Bank and I’d been in London for a week on a course during which I’d been interviewed by the head of female human resources (they were a separate entity in those days). I remember telling the scary woman who ran the department that I had no intention of getting married or having children and that my focus was my career. The plan was for me to move to one of our subsidiary banks in San Francisco, USA, to run their trade finance department. I was twenty and seriously believed I could rule the world. Sitting at my desk was a man with blue eyes, tall with dark curly hair. Since I was suffering with horrendous PMT, I ‘politely’ asked him to remove himself from my chair. He was going to open another branch of the bank in Scotland and was spending time in our branch to see how we’d set up the trade finance department, so he worked closely with myself and my boss. Two weeks later we were engaged. This is a true story. And thirty years and three children later we are still together. He’s my lover, best friend and soul mate. And I wouldn’t be the person I am today without him. I can still remember the head of female human resources phoning me and demanding, ‘Christine! What the hell happened?’ Yep, Karma’s a funny thing at times especially when you have a ‘master plan’ it’ll pull the rug out from under you every single time. Yes I’ve heard that about patience, I haven’t tried it myself LOL! I think the stronger and more complete of a person you are the stronger and more complete of a partner you attract. The best I can do is that I had to go all the way to Albuquerque, New Mexico to find my Texas man (he was born-and-raised in San Antone). I like to think that things all fell into place for us to meet and marry. Beautiful sentiments, Alica!